Formula One : Lewis Hamilton wins at Spa …………. Image via Wikipedia National pride must have much to do with it, but the current form of Lewis Hamilton in the Formula 1 World Championship has rekindled my interest. 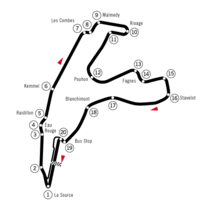 Today’s Belgian Grand Prix from the circuit at Spa-Francorchamps was fantastic entertainment and was – unusually for Formula One since the Turbo era of Senna, Mansell, Prost and Piquet – actually a race. After a cracking start, Lewis fluffed it to spin into 2nd place and then looked like he might come off worse from the pit stop strategy. There were some great tussles throughout the field but Ferrari’s Kimi Raikkonen had it in the bag until Hamilton starting stalking him in the remaining 6 laps of the race. The rain started and the track became a skating rink. It was nip and tuck between the McLaren and the Ferrari, with both drivers sliding and spinning, with the race decided as Lewis held his nerve to leap in front of Kimi. It proved too much for Raikkonen and he spun into the wall and out of the race. Whilst Hamilton fully deserved the victory, spare a thought for the Finn who is now likely to have to take a back seat to the priority given to his team mate, Massa, by Ferrari in the race for the Drivers’ Championship. Cracking stuff and I’m looking forwards to the Italian GP at Monza next week.